A huge selection of mobile slots and casino games on top of generous bonuses – Royal House Casino offers a regal gaming experience! With a name which promises regal treatment, Progress Play’s latest casino – Royal House – has a lot to deliver on. While a huge selection of mobile slots and casino game, and a generous welcome bonus package go a long way to creating an exciting experience, the new site fails to live up to the exclusivity implied by its title, with formulaic playing options and uninspiring game titles. With a number of live games and mobile depositing options available, players should by no means be put off by Royal House Casino’s unoriginal structure, and most will find something to keep them engaged and entertained. There are three main reasons we think Royal House Casino is a strong proposition. Firstly, there’s a broad and extensive choice of games on offer, including over 90 mobile slots, video casino games, and even some live table games for that extra authentic casino experience. Secondly, you’ll feel like absolute royalty when you check out the promotions and bonuses on offer. Not only are you able to claim up to £1,000 in welcome bonus cash, you can also enjoy generous recurring promotions each day of the week. 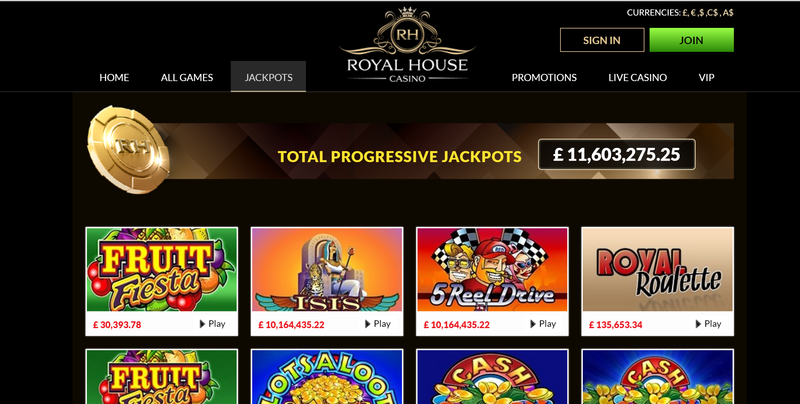 Thirdly, the banking options at Royal House make it a hugely convenient casino to play at. We’ll go into more detail in the banking section of this review, but needless to say, no one should have any difficulty finding depositing and withdrawal options which work for them. As mentioned above, you can enjoy a selection of over 90 mobile slots at Royal House casino. That might sound like an awful lot, until you consider that if you’re playing the desktop version of the site, you have a choice of over 200 slots to pick from. To start naming the slots on offer would be a disservice to the many dozens we wouldn’t have space to include, but suffice to say, with so many different styles and themes of games on offer, you won’t struggle to find something you’ll want to play. Unsurprisingly, not all these games come from a single developer. Progress Play has dug deep to furnish Royal House with games from not one, not two, but 17 top gaming software developers. Developers in the line-up range from the pretty ubiquitous Microgaming, NetEnt and NextGen, to the lesser often seen but still excellent Rabcat, Cryptologic and Elk Studios. In addition to the massive choice of slots, Royal House also appeals to more traditional casino players with online and mobile versions of casino classics like blackjack, roulette, baccarat, and even poker. The cherry on top of this tasty casino cake is that there’s even live dealer versions of blackjack, roulette and baccarat for those players who want to get the feeling of enjoying a real casino. 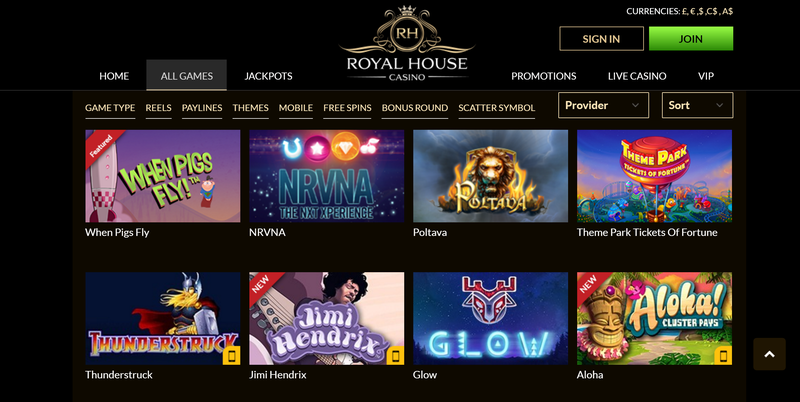 Royal House knows how to indulge its players, and with a generous welcome package being backed up by a number of recurring weekly promotions, players new and returning all get the royal treatment. As mentioned above, we believe that the deposit and withdrawing options presented to players at Royal House Casino are one of the features which most help the site stand out from the pack. When depositing, you obviously have the option to pay with debit or credit cards, you also have the choice to use quicker, more convenient and more secure services like Skrill, Neteller, and PaySafeCard. For you mobile players who want the fastest, easiest and most hassle free deposits, you even have the option to use Pay by Phone mobile deposits (seen by many as the ultimate indication of a great casino. Withdrawals can be made using the same methods, only with the addition of bank transfers and cheques. Unfortunately, you still obviously can’t withdraw using Pay by Phone, so you’ll need to pick another method to get hold of your winnings. The amazing thing about Royal House is that it promises only 1 day processing on all its withdrawals. So speedy. The service at Royal House Casino is good, but could definitely do with some work. Although there is a live chat option available if you have queries, 6am and 11pm GMT, and outside these hours your only choice is to fill in an email inquiry form. It would be good to see perhaps a phone helpline, or a 24 hour chat service – otherwise you run the risk of getting stuck in the dark when you most need help. Want to play at Royal House? Claim £1,000 Welcome Bonus + 25 Extra Spins Now! Royal House Does Royal House live up to its regal standards? Yes and no. We can’t hype the games enough; with so many on offer, the only complaint you can really make is that there’s too much choice and not enough direction. The banking options too shine as a beacon of quality at this casino, as it really seems Royal House want to make deposits and withdrawals as easy as possible. However, there's a nagging feeling when playing at Royal House that you've seen it all before. The games are those you've enjoyed a hundred times at a hundred different casinos, and those bonuses? Sure they're generous, but you'll find the same lineup at any Progress Play site. Here is a great casino in need of a personality. PreviousReview of Mr Spin Mobile Casino — Truly Mobile With 50 Extra Spins Bonus! Duncan has been writing about online casinos for the best part of four years, and his passion for mobile slots and casinos shows no sign of slowing down. He’ll delve into any topic related to mobile gambling, but has a particular penchant for guiding our readers through the often confusing worlds of mobile casino bonuses and pay by phone casinos. Sharing his encyclopaedic knowledge of where to find the best casino deals, or the best places to deposit by SMS is both his duty and his delight. Touch Lucky Mobile Casino Review — £500 Match + £5 Free Bonus!